This highly sophisticated technology by Lutron Shades gives a sense of contemporary style living, with convenient, new age design features. No electrician or technician is needed with the ease of installation from Lutron, the leader in silent and motorized shades. Impress your guests, be a couch potato, or time the shades perfectly with the new Serena shade system, one of our favorite new window treatments of 2014. The communication to the motor is wireless so there is no need for an electrician, wiring, cutting into walls or expensive wires. Equipped with appropriately dubbed “smart motors,” Lutron shading systems include a complex drive system that allows you to control the whole house with your automated system using keypads, IR remote controls, wireless tabletop controls or wall switches. Time Saving Tip: You also have the option to set an astronomic time clock for adjustment of your shades. The unique fabric covered cassette nicely covers the roller shade hardware and batteries. As you see in the video changing batteries is a snap! There is no need to call a technician to do this anyone that knows how to change batteries in a item can do it on this roller shade system. French Door Design Idea: Since it is hard to get electrical wiring through the door on standard wired motorized shades, using battery powered roller shades will work well for a French Door. Take your home window coverings to a new and elegant level by adding in this classic and contemporary design style with sophisticated technology. The material you can use in Lutron Serena battery powered roller shades come in a variety of colors, openness factors, and can even be ordered with blackout fabrics. Lutron shading fabrics are made from sustainable materials for complete environmental and energy savings. Not sure which battery powered roller shade is right for you? 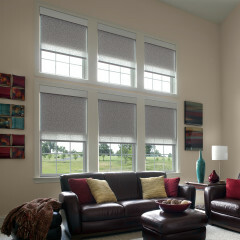 Speak with one of our knowledgeable consultants at 3 Blind Mice Window Coverings to choose the best option. I am looking for battery powered window shades that are able to be controlled from a single remote. There are 3 windows, dimensions of opening are 46″W x 35″H. The mount would be inside the opening with the roll concealed from the inside of the house.